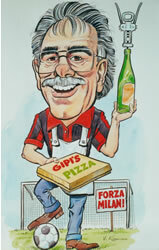 Gipi's Pizza House is located at 511 High Street in Preston and has been servicing the local community for over 30 years. Meals can be enjoyed in the restaurant, or take-away. All ingredients are made in house to ensure Emanuels strict quality standards are maintained. If you haven't had pizza from Gipi's then you haven't had pizza. Full range of pizzas are available including the gourmet range with toppings including sun dried tomatoes, artichoke, rose peppers and spinach. • In addition to pizzas, a wide range of meals are available including Pasta, Steak, Fish, Chicken and Pancakes. Gipi's Pizza House provides Quality and Service at a great price. Emanuel strives to maintain his regular customers some of whom have been returning for 30 years, and always welcomes first time customers with a smile. Gipi's has a full liquor license or BYO with a good selection of predominantly Australian Red and White Wines, domestic and international beers available for purchase. Those of you, who know us well, know that we pride ourselves on good quality food and service. Our motto has always been "fresh produce at its best". We use only the best ingredients to make our mouth-watering pizzas that are renowned. Our pasta dishes, especially our very popular "homemade gnocchi" melt in your mouth, not to mention our famous "strawberry pancakes". The beautiful aroma of the specially blended coffee beans in our cappuccinos and short blacks follow you home. What else can we say, other than we hope you enjoy your meal with us and please let us know if we can accommodate any special requests that you might have. As my grandfather used to say, "Buon Appetito"